Where Is Karl Rove's Feared American Crossroads Machine? The super PAC was a major player in the 2012 election. But so far, it hasn't spent a dime on midterm elections. If 2012 was the campaign of the super PAC, 2013 is shaping up to prove the maxim that there's an unceasing appetite for groups to spend money in politics. 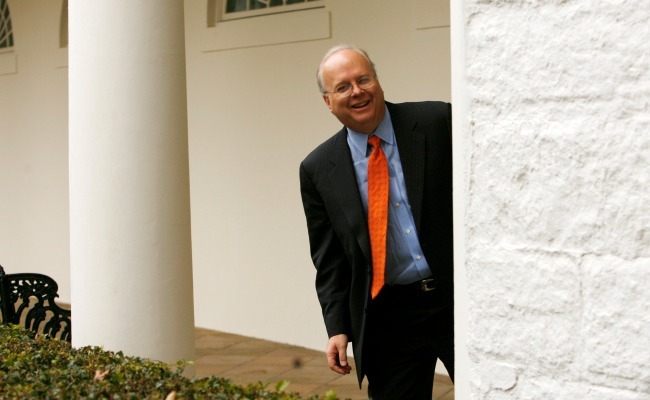 But there's one power player that's lying low in the off year: Karl Rove's American Crossroads. Even with the influx of outside cash, the granddaddy of all super PACs hasn't spent a dime on campaign activity this year. At a time when growing numbers of GOP strategists believe that (very) early engagement against opponents is preferable to a last-minute blitz, Crossroads' passivity stands out. Crossroads hasn't spent any money to soften up Democratic senators in trouble next year. At this point in 2011, it spent early money to hit Sen. Claire McCaskill of Missouri and former Sen. Ben Nelson of Nebraska. There's no similar ad blitz being planned to soften up vulnerable Democrats in 2014. Indeed, the group has held its fire since starting off the year on a controversial note. Soon after the 2012 elections, American Crossroads launched the Conservative Victory Project, a spinoff group designed to prevent weak candidates from emerging in big Senate races. It immediately drew harsh criticism from grassroots conservatives, and hasn't been heard from since February. Meanwhile, the party still faces the very real threat of a Todd Akin-like candidate emerging in ruby-red Georgia, and GOP recruiting in the traditional battleground states has lagged. Meanwhile, the group drew fire from Republicans when it stayed out of this year's high-profile Massachusetts Senate race, declining to assist the party's Hispanic nominee whose campaign was badly outspent by Democratic outside groups. Based on its polling, Crossroads didn't think the race was winnable, and didn't want to start off the year with an expensive defeat. But it was also a leap to assume Gabriel Gomez couldn't win without giving him the resources to get his message out. It's in stark contrast to the flurry of early political activity around them, where money from other outside groups is being spent with abandon. On the left, the League of Conservation Voters already dished out $2 million this summer against Republicans, hitting Sen. Ron Johnson of Wisconsin, who's not even on the ballot until 2016, along with other vulnerable representatives. The Democratic House Majority super PAC spent big against South Carolina's Mark Sanford, while its Senate counterpart helped Edward Markey win the vacant seat in Massachusetts. On the right, the Senate Conservatives Fund has been irritating Republican senators with a slew of radio ads urging them to defund Obamacare. Senate Minority Leader Mitch McConnell, facing a challenging reelection, even has his own super PAC attacking his opposition. And independent New York Mayor Michael Bloomberg is continuing to spend big bucks attacking gun-supporting politicos. Last month, he spent $350,000 to back two Democratic Colorado state senators, both of whom lost recalls this month for supporting gun-control legislation in their state. Several factors are contributing to American Crossroads' lower profile this year. Donations to the super PAC are down in the off year. Through the first six months of 2013, it raised $1.86 million. During the same period in 2011, it raised $3.93 million. After Mitt Romney's defeat and losing 11 of 13 Senate races it spent money on in 2012, big donors are less willing to pony up. The emergence of state- and race-based super PACs is also playing a role in diverting money and focus away from American Crossroads. Crossroads President Steven Law, a former McConnell chief of staff, is on the board of the Kentuckians for Strong Leadership super PAC, which has already been up with ads against McConnell's Democratic opponent Alison Lundergan Grimes. The Americans for Progressive Action super PAC emerged to help Gomez in the Massachusetts Senate special election, though it lacked the firepower of the opposition. "Consultants are trying to be entrepreneurial, by design. They want advisers who have state-specific, candidate-specific expertise," said one Republican super PAC strategist. America Rising, the GOP's opposition research and rapid response start-up, is also laying the groundwork for future attack ads, diminishing the need for early engagement. With resources devoted to research and tracking, they've been able to generate unfavorable news coverage for Democratic candidates at a lower cost than expensive TV buys. Republicans now view different groups filling different roles as a more efficient allocation of party resources than a one-size-fits-all super PAC. "From our perspective, when we engage, we have a long-term sustained strategy we're pursuing rather than spending $80,000 in March of the off year. Early spending is important but it needs to be sustained as part of a longer-term strategy," said Crossroads' Law. "These short-term skirmishes are more designed for a brief impact, and to generate fundraising, and brand positioning. That's something we never have done much of." So far this year, the group spent its time focused on policy over politics, launching small, six-figure publicity campaigns against Obamacare and persuading skeptical Republicans to support comprehensive immigration reform. That shift fell short, with immigration all but dead in Congress and Republicans divided on tactics on battling the president's unpopular health care law. Rove, the group's founder, has become deeply distrusted by some conservative activists, who view him as the face of the dreaded establishment. American Crossroads sources said they haven't begun raising money in earnest for the new cycle; their fundraising efforts are ramping up this fall. Law said the group still expects to spend about $100 million on the 2014 midterms, around the same amount that went toward congressional races in the 2012 elections. But even with an imposing budget, it's striking to see how much more competition the group now faces—with donors, within Republican ranks and in the wider super PAC world. In GOP circles, having a clear and coordinated message is now seen as more important than spending huge sums of money. Indeed, the Senate battleground landscape next year is filled with races in small states -- Alaska, Arkansas, Louisiana, among them -- where it doesn't take that much money to saturate the airwaves with negative ads. The bar for entry is much lower than in the past, inviting much more ideologically-driven competition. Crossroads helped fashion the current campaign finance landscape, and the group will play a pivotal role in 2014, with control of the Senate up for grabs. But if Republicans fall short again, it could easily find itself displaced in a rapidly evolving and growing world of well-funded outside groups.